Terry Pratchett is almost a guarantee for entertaining books. Making Money is no exception. Still, it is not one of the strongest Discworld novels. Some jokes are too overstated and fall flat. Terry Pratchett could have dropped the whole character Cribbins with his false teeth, the related bad jokes and the missing relevance to the story. The main villain, Cosmo Lavish, starts out interestingly crazy, but somewhen topples over to being only stupid and silly. Mr. Bent suffers a similar fate, but not as bad. Over long sections, there is a lack of tension in Making Money. Many of the few moments are created by “evil tricks” like jumping to another story thread just before the conclusion of a big mystery. Despite this critique, Making Money is not bad book. 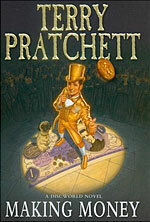 It offers the familiar ingredients of most Discworld novels: Enigmatic characters, one weirder than the other; absurd developments and situations; and a deeper theme borrowed from the real world (in this case the transfer from gold standard to paper money). This article is also available in German: Schöne Scheine.